Added two more buttons for left/right gear brakes. I added a lot of switches and some more dials. I also modified the protocol to fit some functions for TOMCAT F-14B. did you use two or one way switches ? I used two way switches, but I only linked one side. I put ground in the middle and the digital input in one side. I used software pullups. did you upload the sorcecode and the protocol somewhere ? We should add a new section to the newsletter for people doing this sort of thing with FG. We should add a new section to the forum so all Flightgear hardware hackers and home cockpit (aka "simpit") builders can meet there. 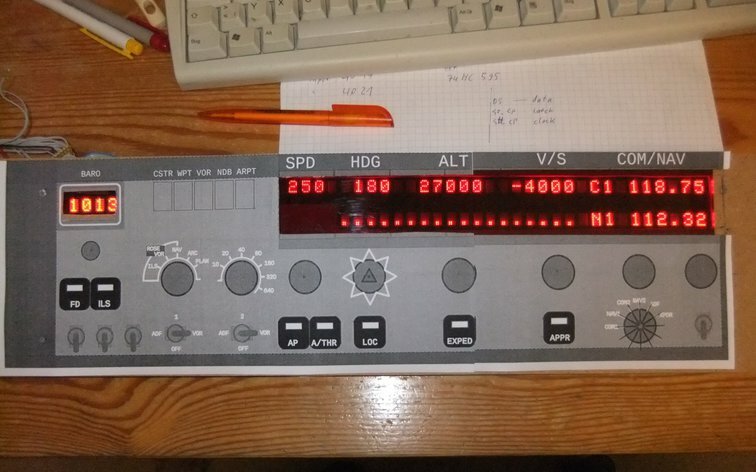 The unit that I'm building will be 48 x 13 cm and include EFIS, MCP(FCU) and com/nav radio. pommesschranke wrote in Sat Dec 07, 2013 11:10 am: We should add a new section to the forum so all Flightgear hardware hackers and home cockpit (aka "simpit") builders can meet there. I agree. I'm also in the planning phase of an Arduino cockpit, and sharing our experiences and knowledge will be very interesting. Besides, building a "simpit" seems a natural activity for any flight sim hobbyist! I have currently all the materials for a twin engine cockpit, and I'm just waiting for the Christmas recess to "wire the cables". I'm planning to build the electrical panel, the comm panel and an autopilot. I'm still unsure if using an Arduino UNO for each panel or just a single Arduino Mega. I'm having problems to locate a rotatory selector like the one you use to select VOR/NAV/ILS... Can you point me to some place to search for them? I've forwarded your subforum request, so it should be just a matter of days now ... it's not a bad idea having a dedicated place for this sort of stuff, you may also want to add some related news to the newsletter, your screen shots definitely look interesting! Thank you, ludomotico & Hooray ! Is your box already connected to FG ? If yes, how did you do it ? For my 2x 32 alphanumeric display I use Atmega32 at the moment - already most ports are used for that display. Either I use 74HC595 as (out)port expander or buy a Mega 2560. 54 IO pins - will that be enough ?